Bealiba is a rural township 170 km north-west of Melbourne and about midway between Dunolly and St Arnaud. The area was originally known as Cochrane's, after John and James Cochrane, who took up a pastoral run in 1853. When gold was discovered in 1855-56 the area was known as Cochrane's Diggings, but the surveyor who laid out the township in 1862 adopted the name of the pastoral run, 'Bealaba', later Bealiba. It is thought that the name is derived from Aboriginal words meaning red gum creek. A school was opened in 1865, by when there was a post office, a petty sessions court, three hotels and three quartz-crushing mills. Farm selections around Bealiba were suitable for grazing, fodder production and cereals. 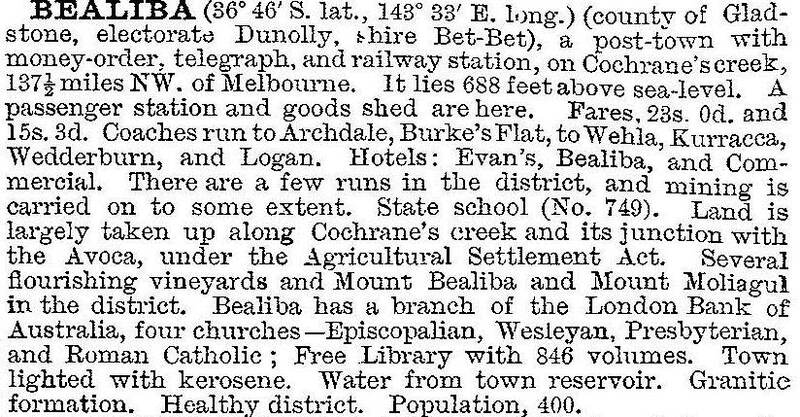 In 1878 the railway line from Dunolly to St Arnaud, via Bealiba, was opened. The line encouraged a firewood trade, and the Bealiba Box blocks were well known for their burning qualities. The forest trees also yielded railway sleepers and fence posts. The present Anglican church was opened in 1871, and Wesleyan and Independent churches soon afterwards. The decline in goldmining did not greatly affect the town's population. In fact the census figures were higher in 1910-30 than at the turn of the century. Bealiba has attractive verandahed buildings, a hall, a hotel, Anglican, Catholic and Uniting churches, a former court house building, a general store, a recreation reserve and a school (44 pupils, 1998; 10 pupils, 2010; 14 pupils, 2014). The railway station (closed 1987) is on the Victorian heritage register. Some of the Bealiba Ranges forest has bushwalking tracks for recreation and fossicking. Cochrane's Creek is west of the town and is joined by two other watercourses which flank the town. In 1867-68, about 6 km north-west of Bealiba, there was the short-lived township of Tunstalls. It came into being with a goldrush and was snuffed out when the temporary buildings were transported to a new gold find. For a season its 1000 residents rivalled Bealiba for importance.